A mucous cyst is a small swelling, containing a jelly like material, found overlying the end joint of a finger. The cyst may fluctuate in size and occasionally burst spontaneously before reforming. 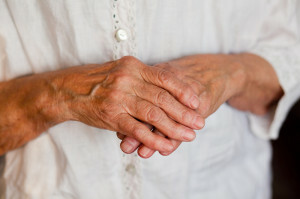 This condition usually affects people between 45-70 years old and is seen in association with osteoarthritis. The cyst communicates with the distal inter-phalangeal joint (DIPJ), which is the end joint of the finger. The cyst may be painful and aesthetically unpleasing. A consultation, involving a medical history and clinical examination, is usually sufficient to make a diagnosis but an X-ray may be taken of your hand(s) to identify any osteoarthritis. No treatment is necessary as mucous cysts are harmless and can just be observed. However, when mucous cysts rupture they risk the spread of infection into the joint. Therefore, surgical treatment is recommended where there is risk of rupture but also if you are experiencing severe pain or limitation to your daily activities. Needle puncture and aspiration is not recommended due to the poor success rate and high recurrence rate. Surgery removes the cyst and lining of the DIP joint and prevents re-formation of the cyst. Also, if there is any osteoarthritis of the DIP joint attempts will be made to reduce this. Mr. Naqui performs mucous cyst surgery at a number of hospitals around Manchester (See Hospitals page). The surgery usually lasts 30 minutes and is a day case procedure requiring only local anaesthetic. The surgical scar is usually 2 cm long. Taking simple painkillers such as paracetamol regularly for the first 2 days after the operation will help to relieve any post-operative pain. Stitches will be removed at 10-14 days after the operation either at your GP or at the orthopaedic clinic. Mr. Naqui and the hand therapist will provide you with specific exercises to perform after the surgery but early finger movements are advised. If you are a manual worker it is advised to stay off work for around 6 weeks. If you work in an office a period of 2-4 weeks off work is sufficient. You are not advised to drive for at least 1 week after surgery. Mr. Naqui will discuss your return to sport with you, depending upon your needs. There may be persistent pain and stiffness post operatively especially if there is underlying osteoarthritis of the DIP joint. The risks of infection, tendon and nerve injury are small. Recurrence is rare following removal of the cyst and the DIP joint lining.